NEW YORK, March 28, 2018 /PRNewswire/ -- Subaru of America Inc., debuted today the all-new 2019 Forester at the New York International Auto Show. The fifth generation of the best-selling SUV introduces the roomiest, most capable and most versatile Forester ever made and also features groundbreaking new safety technology. 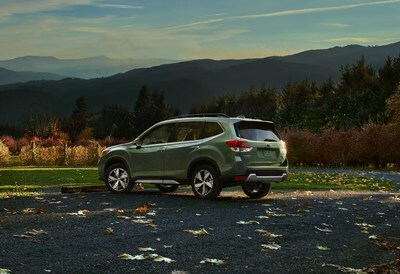 The 2019 Forester is built on the Subaru Global Platform to deliver significantly higher levels of driving pleasure, agility, crash protection, ride comfort and quietness. Arriving at Subaru retailers later this year, the all-new Forester will be available in standard, Premium, Limited, Touring and new Sport trim levels. All are powered by an enhanced direct-injection, 182 hp 2.5-liter four-cylinder BOXER engine featuring Auto Stop/Start and paired with a standard Lineartronic CVT (continuously variable transmission). Also standard on all trim levels is Subaru's legendary Symmetrical All-Wheel Drive. With DriverFocus, Subaru is taking on one of the biggest issues in the automotive industry; distracted driving. Each day in the United States, more than 1,000 people are injured in crashes reported to have involved a distracted driver. * As an industry leader in safety, Subaru has developed DriverFocus, a state-of-the-art system to help address distracted driving for both new and experienced drivers. DriverFocus is a driver monitoring system that uses facial recognition software to identify signs of driver fatigue or driver distraction. DriverFocus works with Subaru's award-winning EyeSight Driver Assist Technology to reduce the chance of an accident. And for added convenience, DriverFocus can also recognize up to five drivers and remember their presets for seat position, climate, multifunction display and more. The 2019 Forester comes standard with Lineartronic CVT. 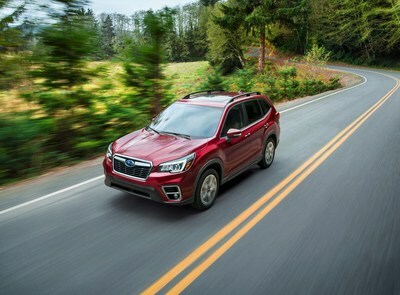 The new powertrain not only yields quicker acceleration than the previous Forester, but also up to 33 mpg highway fuel economy (manufacturer's estimate, pending EPA certification). On Sport and Touring variants, the CVT features a manual mode that simulates a seven-speed manual transmission, using steering wheel paddle shift control switches. Adding more flexibility for driving conditions, is a standard driver-selectable SI-DRIVE. SI-DRIVE is a powertrain performance management system that allows the driver to tailor the vehicle's throttle characteristics by choosing between "Intelligent" and "Sport" modes (Sport Sharp on Forester Sport). "Intelligent" mode helps smooth out accelerator inputs for fuel saving, while "Sport" mode tunes the throttle to emphasize performance. The 2019 Forester debuts a more rugged style that showcases Subaru's new design language while retaining a strong family resemblance to the rest of the brand's portfolio. The exterior has shoulder lines that follow around the pillars to emphasize height and strength. Prominent wheel arches emphasize the standard Symmetrical All-Wheel Drive system's functionality. Front, side and rear underguards are standard on all models, with color finish according to trim line. New LED headlights are standard on all models and complement the brand's signature hexagonal grille. High-gloss black or silver trim highlights the Forester's premium appearance, accentuated by new colors such as Jasper Green Metallic, Horizon Blue Pearl and Crimson Red Pearl. Forester's new design brings added function. The wheelbase is increased to 105.1 in. from 103.9 in., with the gain benefiting rear seat legroom, which is now 39.4-in., a 1.4-in. increase. Gains in headroom, hip and shoulder room further bolster passenger comfort and a feeling of spaciousness in the cabin. Wider rear door openings and a steep C-pillar angle make ingress/egress and installing a child seat easier. All Forester models feature lower body side cladding, which helps protect against mud, rocks and other road debris. The 2019 Forester design increases cargo space to 76.1 cu. ft. with the 60:40 split rear seatbacks lowered, a gain of 1.4 cu. ft. The load floor sits flatter, and the cargo area's squared-off shape has been further optimized for ease of carrying large objects. Notably, the rear gate opening maximum width is now 51.2-in. wide, a 5.3-in. increase over the previous model and up to 8-in. wider than on some competitive SUVs. For example, with the 2019 Forester, it will be possible to load a full-size golf bag sideways without tilting it. A power rear gate is standard on Limited and Touring trim levels and available as an option for Premium and Sport. The roomiest Forester cabin yet is also the quietest, thanks to the Subaru Global Platform's inherent resistance to noise, vibration and harshness (NVH). Road noise is significantly reduced and Subaru has worked to tune out certain frequencies to make conversation or listening to music at highway speeds more comfortable. Forester's interior has been designed for both greater passenger comfort and increased durability in everyday and recreational usage. New front seats, are constructed to enhance comfort on long drives. A new Electronic Parking Brake frees up console space by eliminating the traditional parking brake handle. Numerous new details throughout the Forester reflect the Subaru brand's meticulous study of real-world customer usage. The material used for the cargo area floor, sides and rear gate interior trim offer a textured surface to resist dirt. The robust material also resists scuffing, such as when carrying camping equipment or other outdoor gear, and is easily cleaned. PVC material used on the bottoms of the front seat backs likewise resists scuffing and the material is easily cleaned. Pockets on the front seatbacks are now divided to more easily organize items such as magazines and electronic devices. Each trim level adds more features and amenities, while maintaining all the vehicle's rugged capability. The 2019 Touring is the most luxurious Forester ever, with standard and exclusive features including 10-way power driver's seat, new 8-way power front passenger seat, new heated rear seats and heated steering wheel. Also new for 2019, the exterior mirrors have a two-position memory function synchronized to the driver's seat position memory and in addition tilt downward when reverse gear is engaged, to aid in parking maneuvers. A new power rear lock button is available on the rear liftgate that will close and lock the gate and all doors on the vehicle. The 2019 Forester continues the model's tradition of offering the optimal blend of SUV capability with car-like ride and handling with legendary Subaru Symmetrical All-Wheel Drive. This key technology provides stable, secure driving for young families and all-around capability for outdoors enthusiasts. Subaru's all-wheel drive system actively monitors acceleration, deceleration, cornering and traction to transfer power to the wheels with the best grip. Active Torque Vectoring, first introduced on the brand's iconic WRX ® and WRX STI® performance models, is also standard on all 2019 Foresters. The Forester base model features standard 17-in. steel wheels, while the Premium gets standard 17-in. alloy wheels. Sport, Limited and Touring models ride on 18-in. wheels with each trim featuring its own wheel design. The Forester's new platform integrates the latest version of the Subaru ring-shaped reinforcement frame design, proven over nearly two decades to provide excellent occupant collision protection. All versions of the 2019 Forester come standard with EyeSight Driver Assist Technology that includes Automatic Pre-Collision Braking, Adaptive Cruise Control, Lane Departure and Sway Warning, Lane Keep Assist, Pre-Collision Throttle Management and Lead Vehicle Start Alert. Other available driver-assist technologies include Reverse Automatic Braking and Blind Spot Detection with Lane Change Assist and Rear Cross Traffic Alert. Reverse Automatic Braking can apply the vehicle's brakes if an obstacle is detected while reversing. Inside, the Forester fills out its safety roster with the Subaru Advanced Frontal Airbags, a driver's knee airbag, standard front side pelvis/torso airbags and side curtain airbags that offer front and rear outboard seat coverage. *National Center for Statistics and Analysis. Distracted Driving: 2015, in Traffic Safety Research Notes. DOT HS 812 381. March 2017, National Highway Traffic Safety Administration: Washington, D.C.